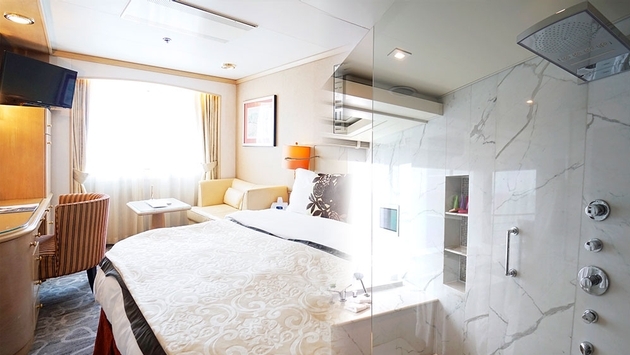 In a day and age when most luxury cruise ships are predominantly all-suite vessels, Crystal Cruises has been unique in offering staterooms as well. This has allowed many to access world-class luxury-level amenities, service, dining and entertainment for a relatively entry-level price point. Of course, there is also a significant difference between cabins and suites onboard. Onboard the Crystal Symphony, for instance, the base accommodation is a Deluxe Stateroom with Large Picture Window, a 206-square-foot basic layout common to most mainstream cruise ships. Walk in, and a small hallway first leads to a bathroom with dual sinks and a tub/shower combo on the left or the right and then a closet and combined bedroom and living area (pictured above on the left) with a queen-size bed or twin beds adjacent to a couch, small table and desk. 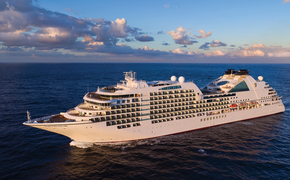 READ MORE: The Future of Crystal Cruises: Where Does Crystal Symphony Fit In? At first, amenities might seem simple, but they actually include complimentary alcoholic and nonalcoholic beverages; an hour of free Wi-Fi internet access per person per day; 24-hour room service; Frette bathrobes, kimonos, and slippers; Schott Zwiesel stemware; ETRO bath amenities and more. The same layout can also be had with a tacked on verandah and as a PURE hypoallergenic room. In between staterooms and suites are the Penthouse with Verandah accommodations sized larger at 367 square feet. This configuration provides more breathing room with a walk-in closet, bathroom with separate shower and Jacuzzi bathtub and a grander bedroom and living area complete with a sofa, chairs and dining table, as well as an expanded balcony. These staterooms also come with butler service. Stepping up yet again leads to the Penthouse Suite with Veranda, which is essentially a wider equivalent of the latter with a separate living room and bedroom, but it’s the 982-square-foot Crystal Penthouse with Veranda that’s the real creme de la creme of suites onboard with a spacious separate living room, dining room, master bedroom and bathroom (pictured above on the right), two walk-in closets, a vanity, half bath and study. Luxurious bonus amenities include an entertainment center, built-in bar, unlimited free internet access, complimentary laundry and dry cleaning services and more. Regardless of the chosen accommodation level, however, all guests receive access to the line’s exceptional service standards, fine dining and wonderful entertainment, all hallmarks of Crystal. With plans for more suites to be added to the Symphony and also the Crystal Serenity in the next couple of years, how many staterooms and penthouses that are displaced to accommodate is still to be seen. What is also not certain is whether the three Crystal Exclusive-class vessels to come beginning in 2022 will include such entry-level accommodations or will instead be built exclusively with suites from the start. There’s a hope at least that Crystal will continue to be mindful of its less affluent guests still seeking a truly luxurious product for a uniquely affordable rate in the market.